The Theory of General Relativity has stood up to an experiment on a scale even the great physicist could have never imagined. Einstein’s Theory of General Relativity has faced its most extreme test yet, with a neutron star and two white dwarfs found to orbit together in agreement with his predictions a thousand times more exacting than ever before. Famously, Einstein’s Theory of General Relativity (GR) is the principle of universality of free fall, with all objects experiencing the same acceleration as they move in an external gravitational field. This means that if you drop a hammer and feather on the Moon, as Apollo 15 did, they will hit the surface at the same time. The greater mass of the hammer means it experiences a greater force of gravitational attraction with the Moon, but that greater force is needed to accelerate its greater inertia. The greater force and greater inertia perfectly cancel, resulting in the same acceleration of the hammer as the lighter feather experiences. The gravitating mass and inertial mass are one and the same in GR, but they don’t need to be. It’s one of the key principles that underpins our entire understanding of the Universe. 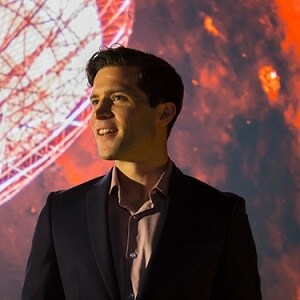 However, in a quest to see if there is an even move fundamental description of our Universe than General Relativity, or to find if our understanding is somehow limited by the theory, scientists put it to the test in ever more extreme environments, known as strong-field tests. Now, a group of scientists led by astronomers from the Netherlands Institute for Radio Astronomy have put General Relativity to the most extreme test yet – seeing if it holds true at the degenerate matter states of a White Dwarf or Neutron Star. The researchers found the perfect naturally occurring system for a strong-field test, PSR J0337+1715, a tight binary system of a neutron star and white dwarf orbiting each other every 1.6 days, with a more distant second white dwarf orbiting this binary in a 327-day orbit. Critically the neutron star beams radiation towards Earth like a lighthouse, which we see as a ‘pulse’ of radiation 366 times a second, known as a millisecond pulsar. The timing of the pulsars is so regular and precise that any changes can be interpreted as being due to the gravitational pull of another body. Thanks to the incredible timekeeping of the pulsar, the astronomers used three of the largest radio telescopes in the world (Westerbork Synthesis Radio Telescope, the Robert C. Byrd Green Bank Telescope and the William E. Gordon telescope at Arecibo Observatory) to look for tiny deviations in the timing of the pulses in over half a decades worth of observations. 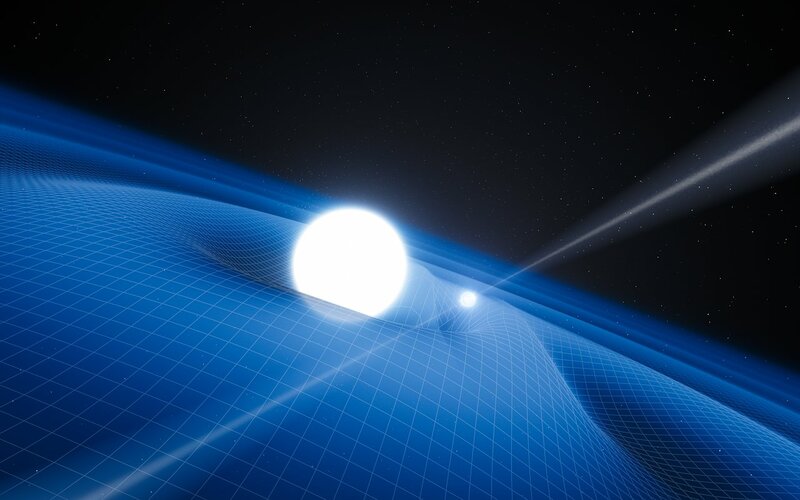 If General Relativity still applies at these strong-field scales, then the inner white dwarf and neutron star would be pulled towards the outer white dwarf star’s orbit equally, so the pulsar signals would stay regular. However, if Einstein’s laws no longer applied and some different theory of gravity was at play, the neutron star and inner white dwarf would “fall” towards the outer white dwarf at different rates, changing the shape of their orbits, turning it more into ‘wobble’, and changing the timing of the pulsar received on Earth. After analysing the data, over 27000 pulses collected over almost 6 years, the astronomers found that the pulsars are all arriving within 30 nanoseconds of the timing predicted by General Relativity. This regular timing means that the Strong Equivalence Principle, the principle of mass falling at the same rate, holds true with an accuracy of one part in a million – a thousand times more accurate than any previous test before. Tests on this scale were not available to Einstein while developing General Relativity, and yet it has held true. No doubt Einstein would be impressed by the experiment, but unsurprised by the result.